In case you haven’t noticed the bombardment of Turbo Tax and H&R Block commercials, it’s tax season. And as you probably know, job or employment-related relocation expenses are tax-deductible. It doesn’t take much time to find information about the usual expenses people can and can’t write off. 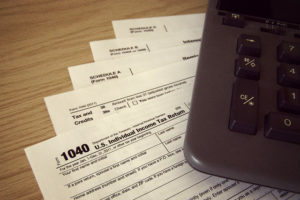 But as anyone who’s filed taxes before, tax deductions are never black and white, and moving-related expenses are no exception. While we encourage you to seek professional tax advice to properly prepare your tax returns, we do want to share some tax information with you. Worldwide ERC’s Mobility Magazine included a fantastic article of these expenses in its most recent issue, but for those who might have missed it, we wanted to offer a summary of the more common expenses people often overlook. Lodging: Moving doesn’t always completely sync up with your schedule. If you needed a hotel in your former city the night after your belongings were packed, or one in your new location the day of your arrival, that’s a tax-deductible expense. Charges not covered by your employer: If your employer gave you a lump sum, or if they did not pay for certain items such as crating, tips to van line staff, shipment of unusual items, etc., these items can be deducted on your taxes. Mileage: If you’re a multiple car family, don’t fret. You can write off the mileage it took to drive to your new home for up to three vehicles. The 2013 rate is 24 cents per mile. Short-term storage: If you need storage for some of your belongings, the first 30 days of storage, as well as the cost of moving those items to and from storage, is tax-deductible. There’s also an entire blog post of information on the tax considerations around the sale of a home. While we won’t get into all of those here, check out Realtor.com’s summary of some of those exceptions in case that relates to you. Distance: The distance from your old residence to your new place of work must be at least 50 miles farther than your old residence and old place of work. Length of employment: You must be employed full-time in the new location for at least 39 weeks during the first 12 months after you arrive in the general area of your new job location. Commencement of work: The move must be in connection with the commencement of work at a new location and moving expenses must be incurred at least one year from the time the taxpayer first reports to the new job. Be sure to contact the Hilldrup Client Services Team if you would like to receive a copy of the Mobility Magazine article or if more information is needed regarding your relocation related tax-deductible expenses.